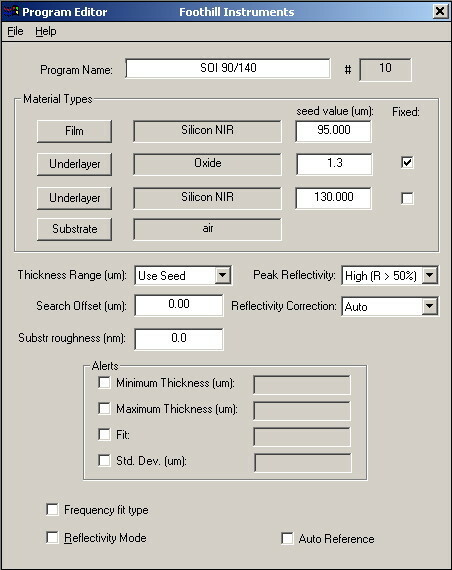 This note describes some methods of defining programs used to measure two layer thicknesses. Foothill Instruments' software algorithms to calculate two layers sometimes require careful setting of the "seed" thickness in the second ("under") layer. Because for many combinations of materials and thicknesses, several possible solutions exist which may look identical or have similar fit values. It, therefore, helps the software if the second calculated layer seed is close to the actual value. This is especially true for silicon-on-insulator (SOI). The reflectivity is very sensitive to the oxide thickness; this requires that this layer is calculated also instead of being a "fixed" layer. For typical oxide thicknesses around 1 micron, several "modes" occur with good thickness results. This means that oxide thicknesses of 0.1, 0.7, 1.3, and 1.9 microns, for example, might all produce good fits when the actual oxide is 1.3 microns. Each solution creates slightly different top layer (silicon) thicknesses, so setting the oxide seed to 1.3 ± 0.1 microns is best. In this example we use a top layer seed slightly larger than the expected thickness; alternately we could have increased the search offset. The oxide layer thickness is close to the actual value, though does not affect the thicker Si thicknesses significantly. The bottom Si seed is chosen experimentally to be less than the actual thickness to produce the best results. Because the layers are transparent, the wafer may be placed with either side up for measurements.